Chris Holm: UNLOADED Vol. 2 is now available! UNLOADED Vol. 2 is now available! 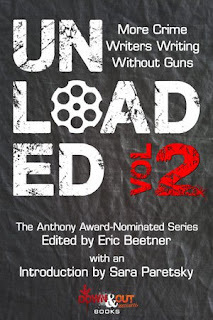 Anyone who regularly reads this blog, or follows me on social media, knows that I'm a passionate advocate for commonsense gun control—so I was delighted that Eric Beetner invited me to contribute to the second volume of his Anthony Award nominated UNLOADED series. These anthologies are a who's who of the crime-fic world. UNLOADED Vol. 2: More Crime Writers Writing Without Guns features contributions from Sara Paretsky, James Ziskin, Laura McHugh, and the late Bill Crider, to name but a few. It also features a brand new short story called "Con Season" by yours truly. And, oh yeah, it's out today! As with the first volume, every story in UNLOADED Vol. 2 is firearm-free—although guns feature prominently in E.A. Aymar's moving essay—and all proceeds go to States United to Prevent Gun Violence. To be clear, though, the UNLOADED series is neither partisan nor anti-gun. Contributing authors hail from both sides of the political aisle, and many of them own guns. What unites us is our desire to end put an end to senseless bloodshed. If you'd like to do your part, and get some kickass crime fiction in the process, pick up a copy of UNLOADED Vol. 2 today.